"Nihil novum sub sole (nothing new under the sun)," said the Romans to indicate that despite the passing of ages, man is always the same and so what happened yesterday is still today and will happen tomorrow as well or similar. It often today happens that , we read about the rushes that broke out at the stadium among the fans that cause dead and injured. Well, these unpleasant events also took place at the time of the ancient Romans, obviously in circuses or amphitheatres. And Pompeii, being in all and a Roman city, could not have been an exception! The Roman historian Tacitus, in fact, says that in 59 AD During a gladiatorial show broke out a dispute between Pompeii and Nocerini that caused the death or injury of many Nocerini. The clash probably came about because of the Pompeian hatred towards the neighbors because they had to surrender land to Nocera when the latter became a Roman colony. Following these disorders, Nero imposed the amphitheater for 10 years; However, the order was revoked only three years later, either through the intercession of Poppea (wife of Nero and native to the area), and to restore a little bit of courage and fun to Pompeii, upset by the 62d earthquake. The episode of the riddle is also represented in a fresco found in a house of Pompeii (now exposed at the Archaeological Museum of Naples), belonging to a gladiator: thanks to this painting we can have a "photography" of the amphitheater and then to know As it was at that time. We notice the presence of so-called "velarium", a curtain, perhaps of linen, which was used to repair the viewers from the sun and the sellers' stalls, all around the structure. Another thing that shows how much Pompeii was a city similar to modern ones? The Pompeian amphitheater is located in the south-eastern corner of the city wall, in a peripheral area so as to impede life as little as possible in the center of the city. In fact, the gladiator shows attracted many people, even from neighboring countries: if that were not the case would not explain the capacity of about 20000 spectators of the amphitheater. But what do we know about this amphitheater? 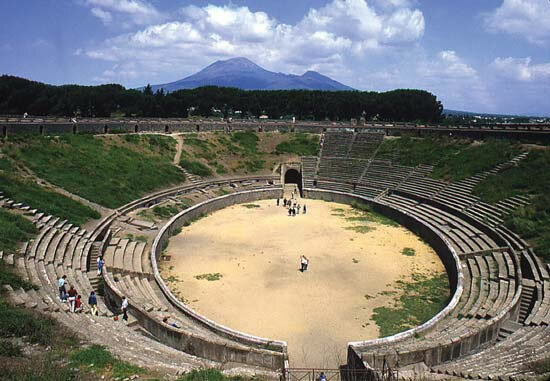 It was built in 70 BC, when the city became a colony, the two most important magistrates in the city, the duovirs, as an inscription says, where the building is not called amphitheater, but "spectacula", a place for shows. In the bottom there are blind arches, where there were the shopkeepers shops and at the top all-round arches. The staircase (cavea) where the spectators were sitting was divided into three sectors: ima cavea (first row) destined for the most visible citizens; Medium cavea intended for the male people and finally summa cavea destined for women. The amphitheater was accessed through a gallery called crypta which had four entrances, two of which led directly to the arena; Along the path to the arena there were two squares, a kind of room for the first aid of the gladiators. It is thought that the magistrates of the city had an entrance and a seat in the amphitheater reserved only to them, since they were very visible characters. The visit of the Pompeii amphitheater, such as the Villa dei Misteri and the casts, is included in the entry ticket to the excavations. Book your excursion with Naples Tour Service: you will be taken from the port, from your hotel or anywhere and carried by our comfortable minivan to the excavations where, if you want, will be waiting for you for our trusted guide that will accompany you on your visit to the city, Making you discover the most impressive points and details. in providing private tours, excursions, day trips in all naples region.